Until recently, acquiring a background in the basic methodological principles that apply to most types of investigations meant struggling to obtain results through laborious calculations. The advent of statistical software packages has removed much of the tedium and many of the errors of manual calculations and allowed a marked increase in the depth and sophistication of analyses. 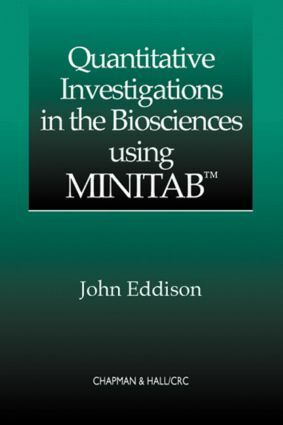 Although most statistics classes now incorporate some instruction in using a statistics package, most introductory texts do not.Quantitative Investigations in the Biosciences using MINITAB fills this void by providing an introduction to investigative methods that, in addition to outlining statistical principles and describing methods of calculations, also presents essential commands and interprets output from the statistics package MINITAB.The author introduces the three basic elements of investigations-design, analysis, and reporting-using an extremely accessible approach that keeps mathematical detail to a minimum. He groups statistical tests according to the type of problem they are used to examine, such as comparisons, sequential relationships, and associations.Quantitative Investigations in the Biosciences using MINITAB draws techniques and examples from a variety of subjects, ranging from physiology and biochemistry through to ecology, behavioral sciences, medicine, agriculture and horticulture, and complements the mathematical results with formal conclusions for all of the worked examples. It thus provides an ideal handbook for anyone in virtually any field who wants to apply statistical techniques to their investigations.